unlike last week's sepia saturday contribution which was taken in a studio, today's photo is a causal snapshot taken by my grandpap. the picture was taken before my grandpap married and features his then future wife, mary (on the left), one of the boys from tomlin tribe, and gradpap's sister sue, who we met last week. 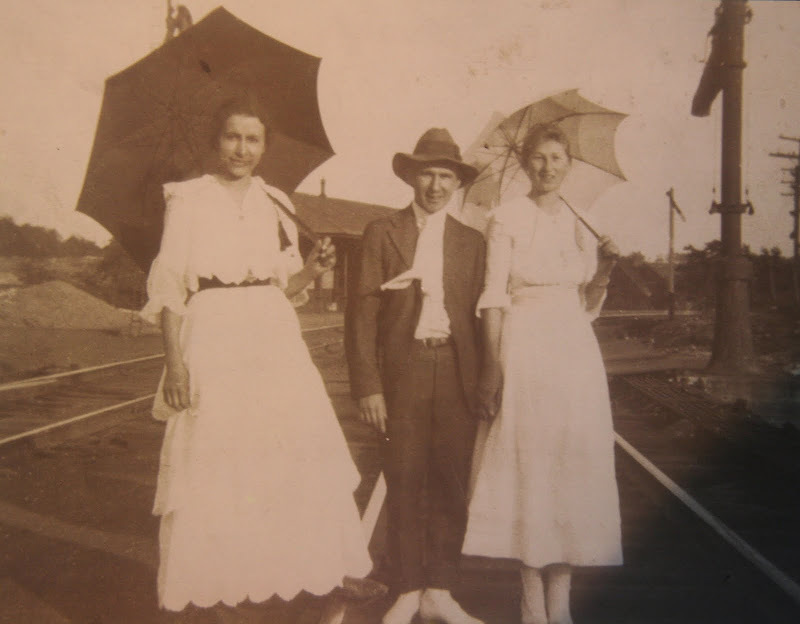 the photo was taken in lofty, pennsylvania, most likely in 1916 or 1917. mary, mr. (first name unknown) tomlin, and aunt sue are standing on the tracks in front of the lofty station. the yanoshik and the tomlin families were among the handful of families that lived in the little village of lofty. today a few descendants of both families still remain in lofty. I'm not sure what the population of lofty is, but according to the 2000 census there were 20 people living in lofty. during its heyday lofty was a busy railroad junction and switching town which was best known for its tunnel - not surprisingly referred to as the lofty tunnel . lofty got its name as it was once the highest point on the route of the catawissa railroad at an elevation of 1,540 feet above sea level. hank williams sr. song I heard that lonesome whistle blow williams released the song in 1951, the song has become a classic country tune and is widely covered. Wonderful post: loved the photo & the story of Lofty, & "Lonesome Whistle" is simply one of the greatest country tunes ever! I am so loving these Sepia Saturdays! So much rich history in our ancestral past. Super post. Very nice! I love the Pollyanna shoes! I just love the scalloped edges of Mary's hem. Looking at old photographs is always so entertaining, even if you don't know the people. I'm so glad I was the recipient of my grandfather's photo albums when he was a teen and 20 something -- it records a world years before my time and gives me a little peek into his life. This is so nice - I love that your grandfather is holding his gal's hand. Great photo. This photo has so much character! They look rather filled with expectation, don't they? I love the parasols framing Mr. Tomlin's big, grinning face. Love it. Mr. Burnett deserves an award for this idea. If you are ever in Lofty, a contemporary picture of that spot would be quite interesting. After reading this post, I couldn't get the voice of Hank Williams out of my head for quite a while. Really nice story. Thank you. What a great photograph. And how fascinating that family links to such small communities are retained in these modern days. Thanks Kimy. i love the contrast between the studio photos from this era, and the more informal outdoor pictures - and the railroad setting really gives this another dimension. Great.